Who We Are All Survivor Stories Giulia Casorati, Ph.D. 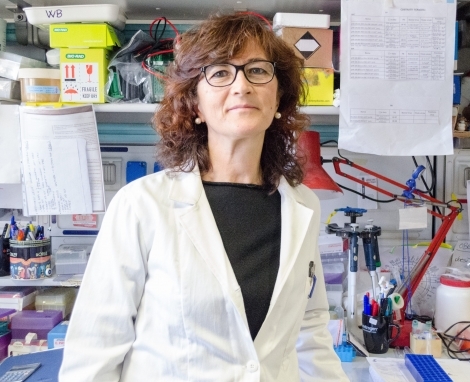 In Italy, Dr. Giulia Casorati is focused on adoptive cell immunotherapy to treat patients with acute myeloid leukemia (AML). Immunotherapy is a groundbreaking approach to treatment that involves harnessing the power of the patient’s own immune system to kill cancer. She is developing an immunotherapy approach that engineers T cells to specifically target CD1, a molecule found on the surface of AML cells. “We are working to develop an innovative immunotherapy strategy to prevent acute leukemia relapse following bone marrow transplantation. Our aim is to genetically engineer T lymphocytes to retarget them against certain lipid antigens contained in leukemia cells that are associated with CD1 molecules. The strategy is such that engineered T cells will kill malignant cells while sparing normal cells and tissues,” says Dr. Casorati, joint head of the Experimental Immunology Unit at Ospedale San Raffaele. She has received nearly $600,000 in LLS support since 2015 to advance this promising research.